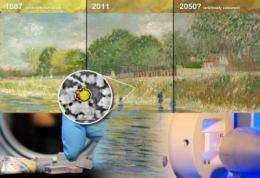 Scientists using synchrotron X-rays have identified the chemical reaction in two van Gogh paintings that alters originally bright yellow colors into brown shades. Scientists have identified a complex chemical reaction responsible for the degradation of two paintings by Vincent van Gogh and other artists of the late 19th century. This discovery is a first step to understanding how to stop the bright yellow colours of van Gogh's most famous paintings from being covered by a brown shade, and fading over time. In the meantime, the results suggest shielding affected paintings as much as possible from UV and sunlight. The results are published in the 15 February 2011 issue of Analytical Chemistry. The work was carried out by an international team of scientists from four countries led by Koen Janssens of Antwerp University (Belgium), with Letizia Monico, an Italian chemist preparing a Ph.D. at Perugia University (Italy), taking the centre stage in the experiments. As an Erasmus student, she worked for one year in Janssens' research group in Antwerp, and is also the lead author of the two papers. Scientists from the CNR Institute of Molecular Science and Technologies (Perugia, Italy), the CNRS C2RMF (Paris, France), TU Delft (Netherlands) and the van Gogh Museum (Amsterdam, Netherlands) were also part of the team. Uncovering the secrets of the chemical reaction needed deployment of an impressive arsenal of analytical tools, with synchrotron X-rays at the ESRF in Grenoble (France) providing the final answers. "For every Italian, conservation of masterpieces has always mattered. I am pleased that science has now added a piece to a puzzle that is a big headache for so many museums" says Letizia Monico from University of Perugia. The experiment reads like a crime scene investigation. The scientists employed an X-ray beam of microscopic dimensions to reveal a complex chemical reaction taking place in the incredibly thin layer where the paint meets the varnish. Sunlight can penetrate only a few micrometers into the paint, but over this short distance, it will trigger a hitherto unknown chemical reaction turning chrome yellow into brown pigments, altering the original composition. Van Gogh's decision to use novel bright colours in his paintings is a major milestone in the history of art. He deliberately chose colours that conveyed mood and emotion, rather than employing them realistically. At the time, this was completely unheard of and, without major innovations in pigment manufacturing made in the 19th century, would also have been impossible. It was the vibrancy of new industrial pigments such as chrome yellow which allowed van Gogh to achieve the intensity of, for example, his series of Sunflowers paintings. He started to paint in these bright colours after leaving his native Holland for France where he became friends with artists who shared his new ideas about the use of colours. For one of them, Paul Gauguin, he started painting yellow sunflower motifs as a decoration for his bedroom. The fact that yellow chrome paint darkens under sunlight has been known since the early 19th Century. However, not all period paintings are affected, nor does it always happen at the same speed. As chrome yellow is toxic, artists quickly switched to new alternatives in the 1950s. However, Vincent van Gogh did not have this choice, and to preserve his work and that of many comtemporaries, interest in the darkening of chrome yellow is now rising again. To solve a chemical puzzle nearly 200 years old, the team around Janssens used a two-step approach: first, they collected samples from three left-over historic paint tubes. After these samples had been artificially aged for 500 hours using an UV-lamp, only one sample, from a paint tube belonging to the Flemish Fauvist Rik Wouters (1882-1913), showed significant darkening. Within 3 weeks, its surface of originally bright yellow had become chocolate brown. 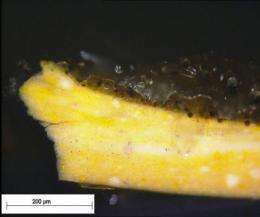 This sample was taken as the best candidate for having undergone the fatal chemical reaction, and sophisticated X-ray analysis identified the darkening of the top layer as linked to a reduction of the chromium in the chrome yellow from Cr(VI) to Cr(III). The scientists also reproduced Wouters' chrome yellow paint and found that the darkening effect could be provoked by UV light. This is an image, made using an optical microscope, of the sample taken from “Bank of the Seine” studied with synchrotron X-rays. The brown layer on top of the paint is varnish, it appears opaque but in reality it lets light through. The brown pigments are invisible to the optical microscope. They are located at the interface between varnish and paint, in a layer less than three micrometers thick. The scale bar at the bottom indicates the size of the sample. Credit: University of Antwerp, Department of Chemistry. In the second step, the scientists used the same methods to examine samples from affected areas of two van Gogh paintings, View of Arles with Irises (1888) and Bank of the Seine (1887), both on display in the Van Gogh Museum in Amsterdam. "This type of cutting edge research is crucial to advance our understanding of how paintings age and should be conserved for future generations", says Ella Hendriks of the van Gogh Museum Amsterdam. Because the affected areas in these multicoloured samples were even more difficult to locate than in the artificially aged ones, an impressive array of analytical tools had to be deployed which required the samples travelling to laboratories across Europe. The results indicate that the reduction reaction from Cr(VI) to Cr(III) is likely to also have taken place in the two van Gogh paintings. The microscopic X-ray beam also showed that Cr(III) was especially prominent in the presence of chemical compounds which contained barium and sulphur. Based on this observation, the scientists speculate that van Gogh's technique of blending white and yellow paint might be the cause of the darkening of his yellow paint. "Our next experiments are already in the pipeline. Obviously, we want to understand which conditions favour the reduction of chromium, and whether there is any hope to revert pigments to the original state in paintings where it is already taking place. ", summarises Koen Janssens from University of Antwerp. The techniques used by the scientists included X-ray diffraction along with various spectroscopies employing infrared radiation, electrons and X-rays at the universities of Antwerp and Perugia, and at two synchrotrons (ESRF and DESY). "I am not aware of a similarly big effort ever having been made for the chemistry of an oil painting", says Joris Dik, Professor at Delft Technical University. In the decisive step, two techniques were combined using a single X-ray beam at the ESRF: X-Ray fluorescence (XRF) and X-Ray absorption near-edge spectroscopy (XANES). For the XRF, the microscopic beam size (0.9 x 0.25 µm2) made possible to separate the study of degraded and unaffected areas, and the XANES technique proved the speciation of chromium, i.e. the reduction from Cr(VI) to Cr(III). "Our X-ray beam is one hundred times thinner than a human hair, and it reveals subtle chemical processes over equally minuscule areas. Making this possible has opened the door to a whole new world of discovery for art historians and conservators," says Marine Cotte, an ESRF scientist also working at CNRS/Musée du Louvre. The reduction of chromium that had been observed in the artificially aged sample from the atelier of Rik Wouters was finally confirmed in both microsamples from the van Gogh paintings. The study was completed with a nanoscopic investigation of the discoloured paint using electron energy loss spectroscopy at the University of Antwerp, which confirmed the results and showed that the newly formed Cr(III) compounds were formed as a nanometer-thin coating of the pigment particles that constitute the paint. 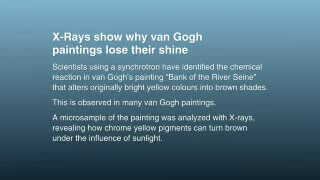 More information: L. Monico et al., Degradation Process of Lead Chromate in Paintings by Vincent van Gogh Studied by Means of Synchrotron X-ray Spectromicroscopy and Related Methods. 1. Artificially Aged Model Samples and 2. Original Paint Layer Samples, Analytical Chemistry 15 February 2011.